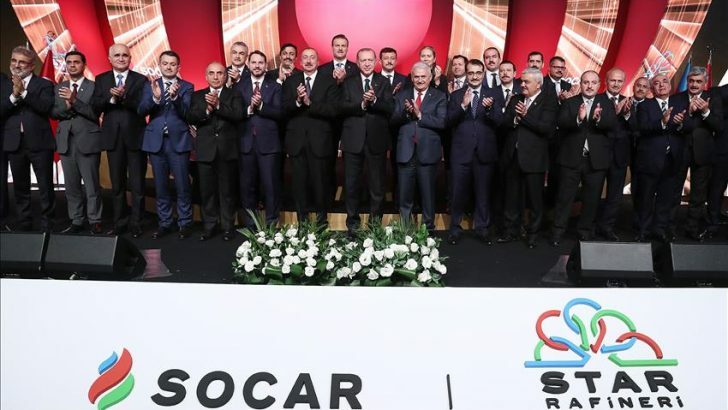 The first new oil refinery to be built in Turkey in 30 years has opened in the Aegean city of İzmir by Azeri oil company SOCAR in a ceremony attended by Turkish President Recep Tayyip Erdoğan and his Azerbaijani counterpart Ilham Aliyev. The $6.3 billion Star Refinery will help cut Turkey’s dependence on imported refined oil products. It will also boost Turkish refining capacity by 30 percent. Aliyev said bilateral relations between the countries have been at the highest level, adding that this was quite normal for people who have been together for centuries. He also noted Turkey and Azerbaijan showed a strong political will in drawing an energy and transportation map of Eurasia. “Our signatures take place under these maps, which require big investments,” Aliyev said, signaling new investments together with Turkey. The refinery, which started construction in 2011, is located near the campus of one of Turkey’s top-ranking industrial enterprises, a container port and the country’s leading petrochemical company PETKİM, owned by SOCAR. Turkey’s total refining capacity will go up by 33 percent to reach 40 million tons per year after Star Refinery becomes fully operational, according to officials. The plant on Turkey’s Aegean coast would have the capacity to process about 10 million tons per year (200,000 barrels per day) of crude. The plant is expected to produce 1.6 million tons of naphtha and 420,000 tons of xylenes. It will also produce about 4.8 million tons of diesel, alongside jet fuel, petroleum coke, reformate, sulphur and liquefied petroleum gas (LPG). Turkey produces a surplus of gasoline but relies on imports of diesel, with consumption of the fuel growing by about 7 percent a year and is expected to reach 25 million tons in 2019. Tüpraş, Turkey’s only refining firm, has four plants across the country with combined processing capacity of 28 million tons (560,000 bpd).